Ch 2 What is Market Data? 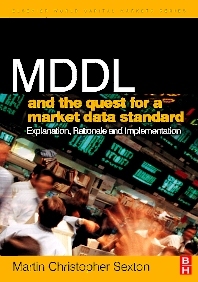 The aim of this book is to provide an objective vendor independent assessment of the Market Data Definition Language (MDDL), the eXtensible Mark-up Language (XML) standard for market data. Assuming little previous knowledge of the standard, or of systems networking, the book identifies the challenges and significance of the standard, examines the business and market drivers and presents decision makers with a clear, concise and jargon free read. Technical material is set off so that Systems Analysts are provided with an explanation to the standard’s business terms, context and deep hierarchical structure thus enabling them to create MDDL compliant interfaces. In this way, the book confers the knowledge to enable business and technology professionals to converse comfortably regarding financial systems integration. At 19, Martin was the youngest person ever to pass the Higher National Certificate in Computer Studies and Business Organisation with Distinction. After spending a number of years as a Computer Games Designer, Martin was eventually lured by the bright lights of the “City”. He is a Principal Consultant with over 15 years experience in the financial industry. Martin has been responsible for interface design and data feed developments at a number of large financial institutions, including Euronext.Liffe (the Pan-European Stock Exchange), Credit Suisse First Boston, Reuters and Cantor Fitzgerald International. Having written White Papers on the deployment of MDDL and a number of articles published on industry standards Martin has put his years of experience into this publication.